Us Floridians have to bear the dreaded hurricane season every year. Therefore, each year from August until October, we can expect downpours, heavy winds, power outages, and floods. Although the hurricane season starts in June and lasts until the end of November, summer months are the most critical. During our lives, we only make several big purchases if we’re lucky. And for most of us, buying a house is the biggest purchase we make. Therefore, it’s only logical to protect it against the harsh weather conditions that the hurricane season brings. Why Roofs Need Hurricane Protection? Everyone knows they need to hurricane-proof their windows. However, sometimes people overlook the most significant thing when it comes to prepping for the hurricane season — protecting your roof. This is especially important if you have an older home with a roof that’s seen better days. If a hurricane damages our roofs, our houses are left vulnerable to water infiltration and the entire inside structure of our homes is left at the mercy of the elements. Although tropical storms and hurricanes are a regular part of the life of Floridians, that doesn’t mean you should ignore them. Protecting your roof against a hurricane should be at the top of your priority list. Here’s Prime Roofing’s guide on how to protect your roof from impending storms. First things first — we have to check the roof. 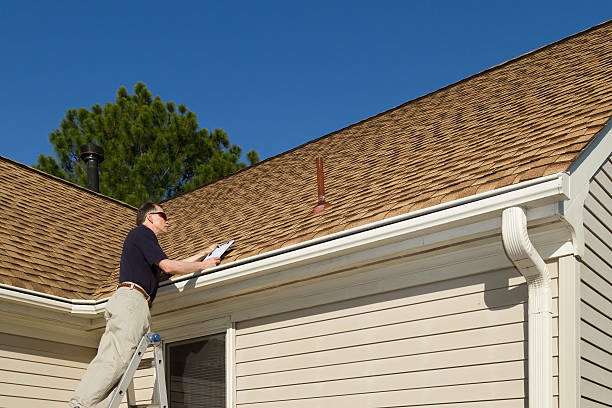 Reinforcing the roof is sometimes necessary, but a regular roof inspection is a must every hurricane season. So once a year, set one day aside and do a thorough checkup. If you don’t like the heights, you can inspect your roof from the ground with binoculars. However, you can also call in the professionals. Prime Roofing will gladly inspect it for you and take care of your roof as if it were our own. We have to take a good look at our roofs. You can use a secure ladder to get up there and check for any possible wears and tears. The roof is the most vulnerable part of your house when it comes to strong winds. Therefore, any loose tiles or shingles can be ripped off, thus creating an unwanted entry point into your home. To avoid water damage, secure everything and pin it to the roof. While up there, also keep an eye on any loose screws and flaking paint. More importantly, if you have a metal roof — be on the lookout for rust and rusty screws. Rust can weaken the structural integrity of the entire roof. Hurricanes bring heavy downpours with them, so it’s crucial that we prepare our gutters beforehand. Drainage systems play a critical role in diminishing potential storm damage. What’s more, clogged gutters can lead to water pooling on your roof. The worst case scenario is that it leaves you with water damage on upper floors and a ruined internal structure. Therefore, we have to inspect all gutters and remove any debris that might be stuck there. In the case of massive blockages, you might need to call in a professional. Roof straps will give the house more structural integrity. What’s more, adding straps is a must according to Florida law. Therefore, you most likely already have them. However, during a roof inspection, you must check if they can withstand the force of hurricane winds that go up to 155 mph. To diminish the wind damage, you can also add roof reinforcements before the hurricane hits. Adding overlapping panels of sturdy materials will keep your roof intact. If you need hurricane straps installed or shingles replaced, you can rely on Prime Roofing to do it for you. We don’t hire subcontractors and will do the job quickly and thoroughly. However, don’t take our word for it — check out the testimonials from our satisfied customers! Internal inspection is just as significant as the external one. The quickest way to see if your roof has any weak points is to inspect for internal damage. Check your attic or upper floors for spots, stains, mold, and peeling paint. Damp ceilings and walls are a sure sign that water has an access point into your home. Furthermore, also check the ventilation, gable vents, and brace them if necessary. Remember, if you see any water damage before heavy downpours even begin, the hurricane will have a disastrous effect on your roof when it comes around. You know what they say — better safe than sorry. You can add a secondary water barrier to be sure that not even a drop of water penetrates your house. If you hear that there’s a hurricane coming your way, take a good look at your yard. You need to secure anything that might come flying at your roof during high winds. To avoid severe damage, pin down anything that might become debris when the hurricane hits, or bring it indoors. What’s more, yard work doesn’t end with cleaning up. It’s also a great idea to trim your trees before the hurricane season. Dead branches can come off pretty quickly when hit by 155mph winds — you don’t want them to end up on your roof. Always check if you’re insured for hurricane damage. While it’s essential to protect your roof and your house against hurricanes, history has shown that sometimes, that isn’t enough. The great news is that you can get a discount on your insurance policy if you add additional protection. Hurricane straps and secondary water barriers that minimize the water damage also make you eligible for reduced insurance premiums. Remember — prevention is essential. It’s better to have a professional look at your roof and advise any potential repairs than to have to call them up once the hurricane rips your roof apart. What’s more, a trained eye might see possible entry points for water damage you might have missed. Therefore, reach out to Prime Roofing at (904) 530-1446 and see what we can do to help you weather another hurricane season. Your roof is in safe hands with us, and you can rest assured we’ll take excellent care of it. Contact us now and spend the next hurricane season doing anything but panicking.